If you would like to apply for one of the limited SCHOLARSHIP DISCOUNTS that reduces the cost of the course to $1995, please contact us here. Basic computer skills and internet connectivity are all you need. Curriculum & Instruction designed by internationally acclaimed teacher and trainer, David Briscoe, honored in 2012 by Michio Kushi and The Kushi Institute International with an Aveline Kushi Award. A training program with an international reputation! Join students from around the world as you challenge yourself to learn, creatively apply macrobiotic principles, and develop practical skills in macrobiotic counseling. The certificate from this program can be acquired and used by any student in any country. 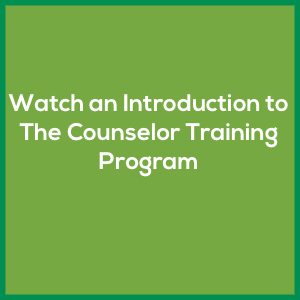 This course includes weekly live online group discussion with the instructor. Enjoy regular online interaction with students from around the world and make international friends as a member of the Counselor Training Students Facebook Group! The student is given access to the course one Process at a time, in order to maintain attention to the sequence of learning. When one Process is completed, the student is given access to the next one. The individual pace of each student is honored. Each student completes the course offline at her or his own pace. The student has up to twelve months to complete the course material. It can be completed sooner if the student chooses. In some cases more time may be needed. Learning Materials are presented via online readings, web resources and occasionally by online streaming audio and video. There are no books to buy. All materials are contained with in the course itself. Readings may be downloaded and printed for reading offline. Live Online “Students’ Questions For Discussion” Sessions are held weekly, every Wednesday at 10am and 6pm Pacific Time. The student can choose ONE of these sessions to attend. They provide an opportunity for the students to meet as a group with the instructor to discuss various questions they bring from their studies of the course material. The online group discussions are for all students no matter what Process of the course they are currently completing. Attendance at the weekly group discussions is not required. Each student chooses ONE of the weekly group discussions to attend. If the student cannot attend the weekly “Students’ Questions For Discussion” live online sessions, no problem, as the discussions are all recorded and available for the student to watch and listen to later 24/7 online at his or her convenience. The weekly group discussions are not “classes” where the instructor lectures, rather they are opportunities for students to bring questions for discussion from their offline studies. The majority of the course study is completed offline, through the Process 1-10 learning materials, by the student at his or her own pace. Online Office Hours are available weekly, after the live online group discussion sessions, for students to ask questions about course procedures, and to receive advice about their studies. If a student is interested in private tutoring related to topics taught in the course, this can be arranged at an additional fee. Software Programs necessary for the course are free and can be easily downloaded from the internet. Computer System for accessing course materials can be Windows or Apple (Intel processor running OS 10.5+). The student needs to be able to send and receive email and email document attachments, and familiar with how to browse the internet. Live Online Weekly “Students’ Questions For Discussion” Group Sessions are accessible via iPads, iPhones and Android devices, as well as all desktops and laptops. A Complete Online Orientation is given to each student via video demos prior to beginning the course. You are shown exactly how to participate in the online discussion, how to access the learning materials 24/7, and how to get set up for enjoying and benefiting from all aspects of the course. Early enrollment is also possible prior to the Early Enrollment period. It is highly recommended that you register as early as possible during the Early Enrollment period to secure a place in the course. Starting the course at times other than the official starting dates is sometimes permitted. Contact us for more information. The tuition includes a $600 non-refundable Administrative / Online Technical Set-Up Fee covering the administrative and technical set-up process that begins immediately after enrollment. When the student sends a signed and dated formal written notice of withdrawal from the course before the starting date, a tuition refund minus the $600 Administrative/Online Technical Set-Up fee is made. Please Note: voicemail message, email, Facebook message, Twitter message, text message, and phone call, are not accepted as formal notices of withdrawal. If the withdrawal is received by regular mail, in writing, within the first six months after the starting date, the $600 Administrative/Technical Set-Up fee and $400 for each month or part thereof of the first 6 months of enrollment will be deducted from the $3200 or $5200, whichever amount you orignally paid. Refund is not available when the course has been registered through a scholarship discount. If withdrawal takes place after the first six months of enrollment, there is no refund. However, should the student want to place the enrollment on hold after the first six months rather than withdraw completely, it may be requested to resume with the remaining months of the course, within one year, at no extra fee. Please Note: Like most schools’ tuition refund policies, ours is based on the actual time the student has been enrolled in the course, beginning with the first registration payment, not on the amount of material the student has covered or the level of participation in the course prior to withdrawal. There is no refund when taking the course through a payment plan. Q: Who may apply for the 12-month course? A: Anyone who is personally practicing macrobiotics and has a sincere desire to be of service to humanity may apply. Prior macrobiotic counseling experience is not necessary. Willingness to work hard, think for yourself, and to be highly self-motivated for independent study are a must. The successful online student is a person who enjoys learning and communicating via online technology such as email, downloadable documents, chat room discussions, online bulletin boards, streaming audio and video, etc. Q: How is it possible for the tuition for the Macrobiotics America online counselor course to be so much less than in-person courses? 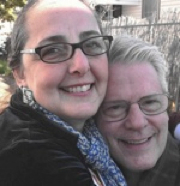 A: We are happy to offer an affordable tuition cost so that more students can become macrobiotic counselors. Since we do not have the high expense of a large on-site staff, and also not needing to add charges for the maintenance of a physical facility, we can pass along big tuition savings to the students. You’re paying only for the education. In addition, being an online course, there is no need for us to charge for housing and meals, allowing even more savings to be passed along to students. The students in our course further save by not having to pay for travel expenses and the many personal expenses of being away from home. Q: How can I finish the Macrobiotics America online course in 12 months when the time to complete in-person certification courses usually takes much longer? A: Our course allows the students to complete their studies at home, avoiding the time-consuming factors of adjusting their schedules and then traveling back and forth to a physical site to attend sessions that can sometimes be weeks or months apart. As a result, many students have shared that the amount of information and learning in our online course was actually more than when they took an in-person course, even though it takes less time to complete our course. Q: Will I really be able to do quality macrobiotic counseling at the end of this course? A: Yes, if you dedicate yourself, study hard, and have the true desire to be of service to humanity, you will be able to do quality macrobiotic counseling by the end of this course. Actually, students do macrobiotic counseling during the course itself. This is a practical course that is 100% designed toward the goal of eventually doing macrobiotic counseling, not just studying and thinking about it. Keep in mind that it will not be a certificate, the teachers you can name, or the amount of time studying that will determine your success as a macrobiotic counselor. It will be your spirit of service, dedication, hard work, on-going experience, endurance and compassionate realtionship with others that will build your practice, skill, and reputation over time. Q: What is the difference between this macrobiotic counselor training course and other macrobiotic training I might find? A: There are several good macrobiotic training programs. They all offer useful information and instruction. For our training program we only accept students who have the goal of being a macrobiotic counselor. It is not a general macrobiotic program. 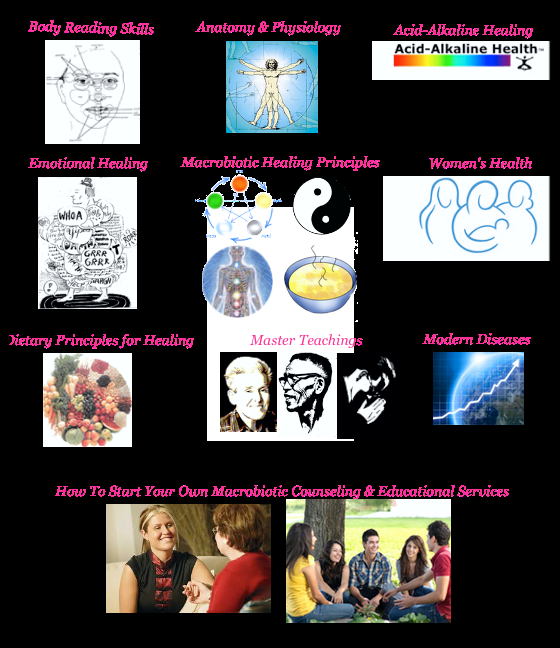 Our course provides focus on macrobiotic counseling, on-going support during the studies, a certificate of completion, membership in the world-wide association of Macrobiotics America trained counselors, regular opportunity for interaction with the instructor and other students from around the world, practical guidance for becoming a counselor, and support for establishing your own local macrobiotic counseling and education program. Macrobiotics America trained counselors who have distinguished themselves by hard work and service to humanity may be invited to teach and counsel at Macrobiotics America events in North America and elsewhere. Q: What if I’ve already studied and/or graduated from a macrobiotic training program? A: Students who received previous macrobiotic training elsewhere have expressed pleasant surprise that they learned so much that was new and interesting in this course.